Posted on December 9, 2010, 5:55 pm, by Andy, under Holidays, My Life, Science Fiction, Star Wars. It's even clearly labelled and everything. What treasures await us inside the box? I think you know. 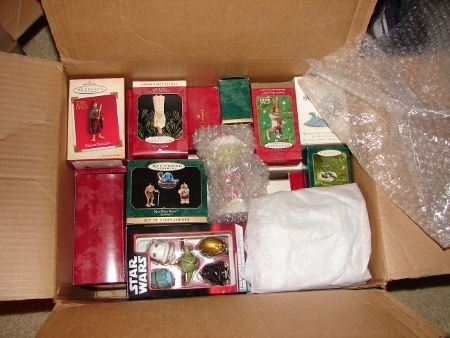 Yes, Virginia, that is a Sy Snootles and the Max Rebo Band ornament. Jealous? In retrospect, I definitely missed an opportunity to lecture her about one of life’s hard realities: fear leads to anger, anger leads to hate, hate leads to suffering. And that, in turn, leads to you eventually getting tossed down into the Death Star’s power core by your apprentice. Oh well. Life will teach her that lesson soon enough without my help. Also, Merry Christmas. 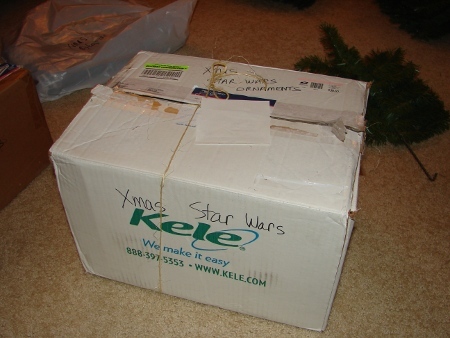 It just doesn’t feel like Christmas if I don’t hear “The force is with you young Skywalker…but you are not a Jedi yet” every time I plug in the tree. I hope she doesn’t have to learn that lesson the hard way! « You know who else liked instinct?